RIMS brewing supplies for direct heating mash water (wort). The mash water is pumped through a tube, past heating elements, and heated to the proper temperature prior to returning to a Mash Lauter Tun. 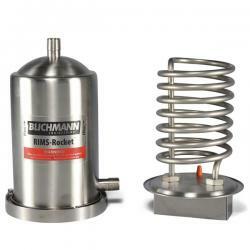 Complete your electric brewery with the RIMS-Rocket form Blichmann Engineering. 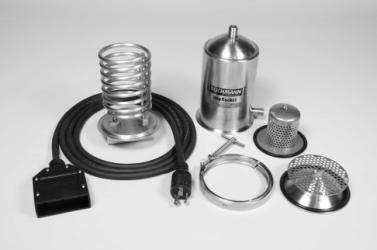 RIMS stands for Recirculation Infusion Mash System, and it allows you to heat your mash with the use of electricity, instead of a propane/natural gas burner. This is great for those wanting to move their brew day indoors. 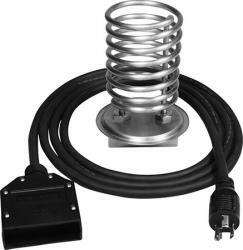 The immersion heating coil of the RIMS-Rocket leverages the HopRocket canister for its housing, so existing HopRocket owners can simply purchase the conversion kit to be up and running. For those that don't own a HopRocket, the bundle item can be purchased. The RIMS-Rocket heating element is LESS THAN ultra low watt density which means NO chance of scorching, and is engineered to perform optimally in your RIMS system. The RIMS-Rocket includes a "plug and play" 12ft factory wired cable with a molded twist-lock plug on one end, and a Blichmann custom removable plug on the other end. The cable is 12 gauge high quality very flexible cable. Each cord will have a factory installed plug on each end, so the product is truly plug-and-brew! The heater end of the cable is terminated with a Blichmann custom molded plug. The other end is terminated with a twist-lock connector: L6-30P for the 240V model, and L5-20P for the 120V model.